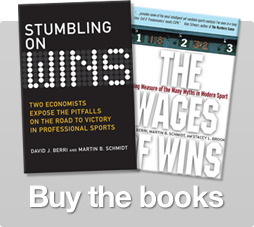 The Wages of Wins Journal – Page 5 – Taking aim at the lies and damned lies in sports with stories written by the numbers. Julien Rodger discusses a proposal to add more excitement to the Major League Baseball season. Jonathan Weiler discusses a recent column by Bill Simmons on Carmelo Anthony. DJ provides an assist! On Friday I took a test on LeBron’s move back to Cleveland. Let’s say I didn’t score a 100%. Here are the college Wins Produced numbers for the players selected out of college in the 2014 NBA draft. Make sure you read all qualifiers before adopting any emotional response! Jill Harris explains how the performance of just three players explains the decline of the LA Sparks this season. Here are some links to radio interviews (and/or podcasts). The topic covered include tennis, the World Cup, the NBA Draft, the Clippers, and LeBron James. My latest for the Atlantic looks at the NBA draft. And the biggest gathering of sports economists in the world is this weekend!